Journey from the "Sacred Mosque" to the "Farthest Mosque"
Today, Sunday, is a public holiday in the UAE and most of the Gulf and Middle East. It is Al-Isra’ wal Mi'raj -- الإسراء والمعراج -- an important observance day in the Muslim calendar. It falls on 27 Rajab in the Hijri calendar, corresponding to May 25 this year. It also marks the countdown to the start of the Holy Month of Ramadan, which falls on June 28 or 29. Al-Isra’ wal Mi'raj marks the two parts of a physical and spiritual night journey that, according to Muslim tradition, the Prophet Muhammad (PBUH) took during a single night circa the year 621. A brief sketch of the story comes in Sura 17 Al-Isra of the Holy Quran. Other details come from the hadiths or supplemental writings about the life of the Prophet. Surat Al-Isra’ (The Night Journey), also called Surat Bani Isra'eel (Children of Israel), is the 17th chapter of the Quran with 111 verses. The Prophet Muhammad travels on the steed Buraq to "the Farthest Mosque,” where he leads other prophets in prayer. He then ascends to Heaven where he speaks to God, who gives Muhammad instructions to take back to the faithful regarding the details of prayer. Glory to (Allah) Who did take His servant for a journey by night from the Sacred Mosque to the Farthest Mosque, whose precincts We did bless -- in order that We might show him some of Our Signs: for He is the One Who heareth and seeth (all things). 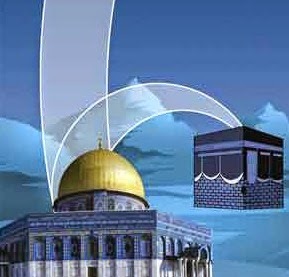 It is generally agreed the “Farthest Mosque” refers to al-Aqsa Mosque in Jerusalem and the “Sacred Mosque” refers to al-Haram in Mecca. The Sura was revealed in the last year before the Hijra. Its main theme is salat (daily prayers), whose number was fixed at five during the Mi’raj that it alludes to. The Sura also forbids adultery, calls for respect for father and mother and for patience and control in the face of the persecutions the Muslim community was facing at the time. According to traditions, the journey is associated with Lailat al-Mi'raj, one of the most significant events in the Muslim calendar. The Night Journey starts with the appearance of the Archangel Gabriel (who was bringing the revelation of the Quran). Gabriel leads Muhammad to a white mule with wings attached to its thighs. This mule had carried other prophets, including Abraham, and was the Buraq or spirit horse. Muhammad gets on and goes high into the sky. Muhammad is asked to lead them in prayer and did. Three dishes are placed in front of Muhammad containing water, wine and milk. Muhammad said he knew of the prophecy that if he chose water the Muslim community would drown, if he chose wine they would leave the true path, and if he chose milk they would follow the true religion of the one God. He chose milk and drank from it. Gabriel confirmed the prophecy. Then Muhammad lifts up to the first gate of Heaven guarded by the Angel Ishmael (first son of Abraham) who was in charge of 12,000 more and each of those had 12,000 of their own. All these 144,000,001 angels guarded the one gate. Ishmael asked Gabriel if Muhammad was the one sent to deliver God's message to humankind and Gabriel confirmed this, so Muhammad was let through. Muhammad passes through seven heavenly realms. In the First Heaven he sees Adam being shown the souls of his descendents both good and bad. In the Second Heaven he sees Jesus and John, son of Zachariah. In the Third Heaven he sees Joseph, son of Jacob. In the Fourth Heaven he sees Idris, the prophet from before the flood. In the Fifth Heaven he sees Moses' older brother, Harun, with his long white beard. In the Sixth Heaven Muhammad meets a tall man with a hooked nose and Gabriel says it is Moses. In the Seventh Heaven Muhammad sees an old man seated by the gate to Paradise where 70,000 angels pass through each day but do not return until Judgment Day. Gabriel identifies him as Abraham. Gabriel then takes Muhammad into Paradise where he speaks to God who tells him the importance of regular prayers. On the way back Moses asks how many prayers have been commanded and Muhammad says 50 a day. Moses tells him to go back to God and get the number cut. God reduces the number to 10 a day but Moses again says this is too many. Muhammad returns to God and they are reduced to five times a day. Moses says this is still too many, but Muhammad tells Moses he is too embarrassed to return to God again. Sidrat al-Muntaha marks the end of the Seventh Heaven, the boundary where no creation can pass, according to Muslim beliefs. Muhammad then returns to Mecca. When he describes his journey to followers, many don’t believe he had gone to Jerusalem in one night, seen the Seven Heavens and had spoken with God. Some of the disbelievers went to Abu Bakr as-Siddiq (one of the senior companions -- Sahabi -- father-in-law of Muhammad and the first Muslim Caliph following Muhammad's death). Abu Bakr asked the Prophet to describe Jerusalem. He did and Abu Bakr declared all the details were accurate and so Muhammad must have been there. So today, we celebrate the miracle of Al-Isra’ wal Mi’raj, the night journey and ascension of the Prophet Muhammad (PBUH). This Thursday morning sees the launch of the latest “My City… My Environment” campaign by the waste management department at Dubai Municipality. 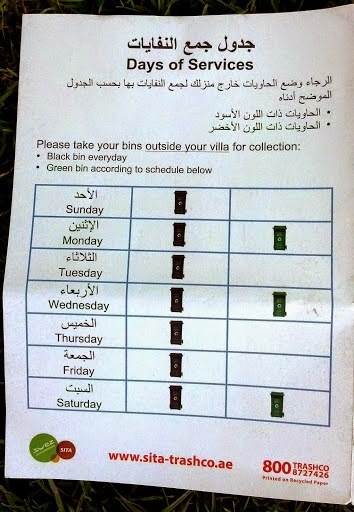 Everyone must have noticed the two plastic bins, one green and one black, in front of all the villas, whether residential or commercial, in Jumeirah 1, 2, 3; Al Safa 1, 2; Umm Suqueim 1, 2, 3; Al Manara, Umm Al Sheif and Al Barsha 2, 3 areas. Over the past two weeks, the “Mr. 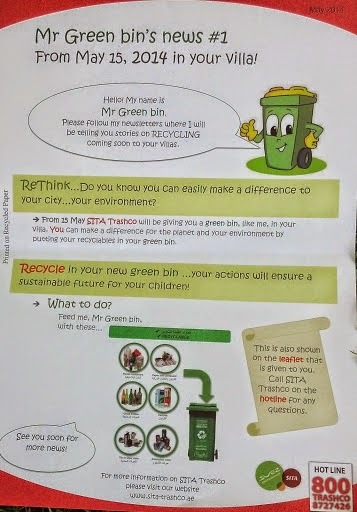 Green Bin,” leaflets were widely circulated, informing us that starting May 15, SITA Trashco will be distributing the bins. Dubai Municipality’s campaign aims to focus on the collection and segregation of waste at source to reduce waste to landfill. “This door-to-door waste collection and recycling service for all the residents is a unique initiative that will educate the public and allow them to help Dubai Municipality in recycling the household waste in an efficient manner,” he added. Dubai Municipality has chosen Dulsco, Averda and Trashco as its strategic partners for this “My City… My Environment” initiative. 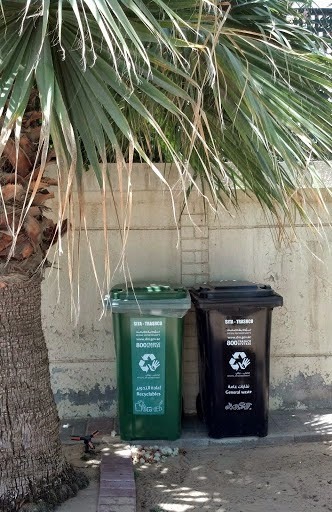 The two green and black 240-liter bins have clear instructions to help residents separate the waste. The black bins will be collected every day and the green ones three days a week on Monday, Wednesday and Saturday. 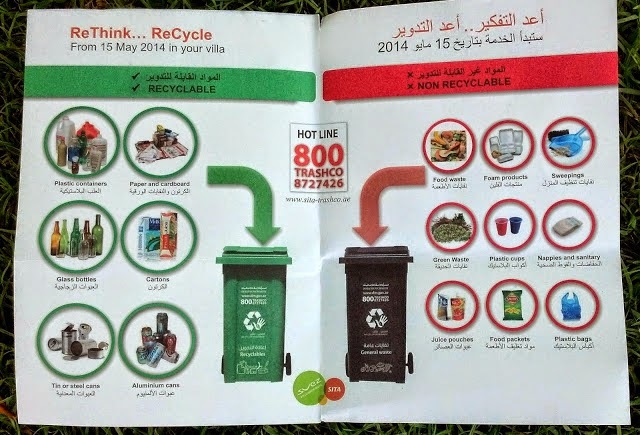 The leaflet clearly indicates what should go in each bin. 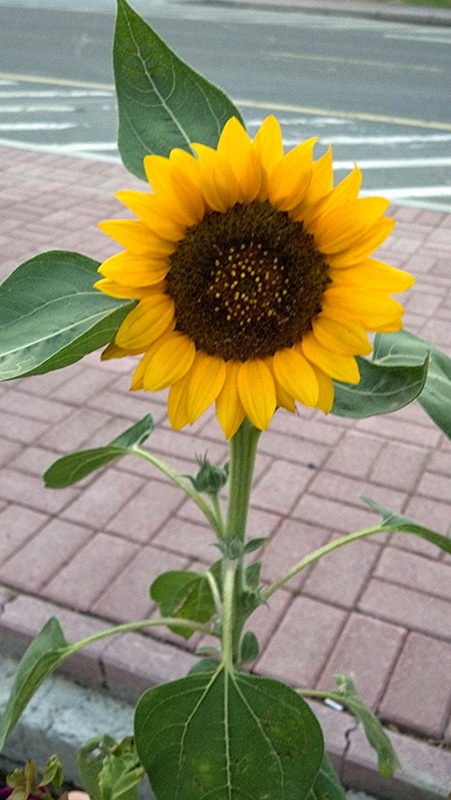 The green bins are for recyclables such as plastic containers, cardboard boxes (flattened out), newspapers, magazines, books, papers, empty water glass and plastic bottles, aluminum and metal cans as well as milk and juice bottles and cartons. Unfortunately, along with this project, our friendly municipality street cleaner will no longer operate in the 12 areas designated for the door-to-door collection and recycling campaign. The street cleaner in my area had become a friend over the past eight years and came to my rescue a couple of months ago while I was walking the dog with my late friend. I will always be thankful to him for that. Cleaners from private companies Dulsco, Averda and Trashco will now take over the complete waste management tasks from workers of Dubai Municipality which is privatizing street cleaning services for the first time in the emirate. The municipality will also discontinue the use of large waste skips on the roads in these areas. Now it remains to be seen if and how residents and businesses respond to the campaign and how the private companies will maintain cleanliness on our streets and the regular collection of the bins. This might well be true. The Cedars, it turns out, are into music too! “3,000 Years” is the first track in history created using a rhythm extracted from inside a Lebanese Cedar tree in the Barouk Forest and is now the focal point of the “Save the Music” campaign for Cedar conservation in Lebanon. Although a few weeks old, I was blown away by the sounds and had to share this. The initiative to give the Cedar a voice for conservation was launched by the Lebanese Ministry of Environment, in cooperation with the Ministry of Education. The Cedar tree's rhythm was extracted by Derek Shirley, a Canadian bioacoustics engineer based in Germany He extracted the audio data from the Cedar by hooking a synthesizer reading mechanism sensitive to electric movement in living organisms to the ancient tree. “We've recently discovered that each tree species creates its own rhythm,” Shirley said in a YouTube video entitled “Save the Music -- Save the Cedars.” “As it turns out, the Lebanese Cedars are especially rhythmic,” he added. After Shirley extracted the raw, rhythmic beat, Beirut-based DJ ESC (Ribal Rayess), in collaboration with Jad Jazzy Jay (Jade Hazim), used the raw sounds to compose a House track. "At the beginning of the [original] track you can hear about 20 seconds of raw footage that make base sounds," Rayess told Beirut’s The Daily Star. "It blew my mind." Rayess said the lyrics, sang by Marlene Jaber, were "simple" with the intent to unite Lebanese, regardless of sect, under the symbolic Cedar tree. "The words reminisce 3,000 years of the Cedars," he said. By downloading the track and sharing the video, you're not only acting to save Lebanon’s Cedars, you're buying a song that's been playing for 3,000 years. …Throughout antiquity, the Cedars of Lebanon were prized above all other trees. Their fine wood is strong, straight and wonderfully scented. Cedar wood was the first choice for any temple or palace. These magnificent trees helped give the Phoenicians a high place among other nations, and became the symbol by which they and their descendants were known. 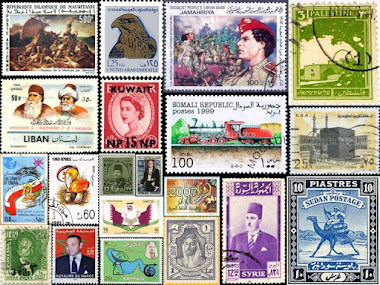 Revered and admired, they stand for prosperity and national pride. But the cherished Cedar Tree (Cedrus libani) is not well. It is fighting its own revolution against time. It is feeling the strains of centuries and is at risk from global warming and insects. It has now been added to the list of threatened species, although at the lowest level of threat, by the International Union for Conservation of Nature (IUCN), the world’s oldest and largest global environmental organization. In the past, Lebanese mountains were covered with Cedars. Sadly, all that is left today is 18 scattered patches of protected Cedar land. In total, protected forests (both Cedar and other) make up approximately four to eight percent of the Lebanese territory. Alphonse de Lamartine visited the “Cedars of the Lord,” or Arz al-Rab near Bcharre, back in 1832. Putting a memorabilia on the trunk of a very old Cedar tree commemorated his visit. When it died, Lebanese Bcharre-born painter, sculptor and poet Rudy Rahme created the “Lamartine Cedar,” one of the most remarkable wooden and largest vegetal sculptures in the world. It stands 39 meters high and contains 70 human figures representing the relationship between time and place. Among the figures are the birth, life and death of Jesus. Arz al-Rab are the oldest Cedars in Lebanon and give an accurate idea of the stature and splendor these trees attained in antiquity. About 375 Cedars of great age stand in a sheltered glacial pocket of Mount Makmel. Four of them, many hundreds of years old, have reached a height of 35 meters and their trunks are between 12 and 14 meters around. They have straight trunks and strong branches that spread their regular horizontal boughs like fans. Also among the inhabitants of the forests are some thousand young trees. Concern for this modern remnant of historic Cedars goes back to 1876, when the 102-hectare grove was surrounded by a high stone wall. Financed by Queen Victoria, the wall protects against one of the Cedar's natural enemies -- the goats who enjoy feasting on young saplings. Over the centuries, Assyrians, Babylonians and Persians made expeditions to Mount Lebanon for timber or extracted tributes of wood from the coastal cities of Canaan-Phoenicia. The Phoenicians themselves made use of the Cedar, especially for their merchant fleets. Solomon requested large supplies of Cedar wood, along with architects and builders from King Hiram of Tyre to build his temple. Nebuchadnezzar boasted on a cuneiform inscription: "I brought for building, mighty Cedars, which I cut down with my pure hands on Mount Lebanon." Its fragrance and durability, as well as the length of the great logs, made Cedar wood especially desirable. The Egyptians used Cedar resin for mummification, and pitch was extracted from these trees for waterproofing and caulking. Luckily, there is now an active program to conserve and regenerate the forests. The Lebanese approach has emphasized natural regeneration rather than planting, and this by creating the right conditions. Cedar and Nature Reserves created by the Lebanese state that contain Cedars include the Chouf Cedar Reserves, the Jaj Cedar Reserve, the Tannourine Reserve, the Ammouaa and Karm Shbat Reserves in the Akkar district, and Arz al-Rab forest. 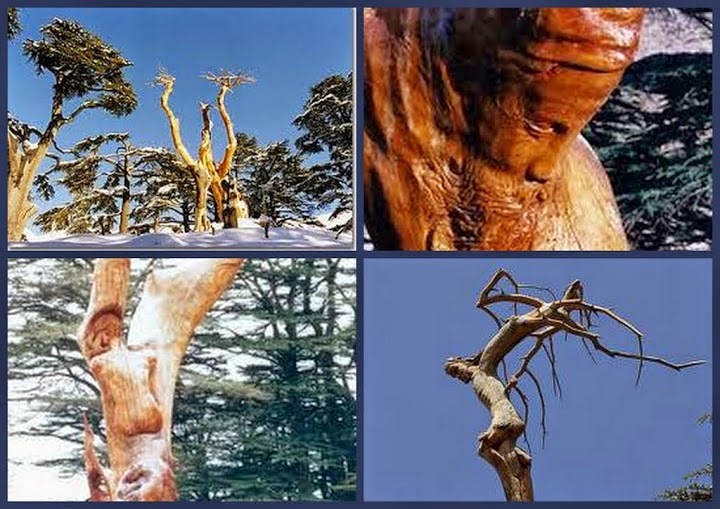 In 1998, the Cedars of God were added to the UNESCO list of World Heritage Sites. Where do you even begin when you are starting over? What do you do when you have lost half your soul? It is a long and painful road, but road there is and walking it is a must. I will stumble and fall along the way. Fortunately, there will be wonderful family and friends to pick me up and keep me going. A first step is to come back to Mich Café. I have missed it so much and apologize to you, the readers, for being absent for so long. 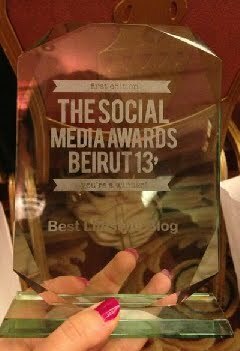 There were many posts to write but I had neither the courage, the heart or the concentration to write them. My only concern and dedication over the past nine months was to help the person closest to me fight his battle with cancer. But I am lucky to have shared someone’s life for so long and to only have good memories. We were always able to see the funny and positive side of every situation, whether good or bad. These memories are a treasure. They will pave the tortuous way ahead.